The Blue Lion's water powers make it a must-have for any battle, ready to kick it into high gear! The Blue Lion is the friendliest of the lions and is the most accepting of new pilots. 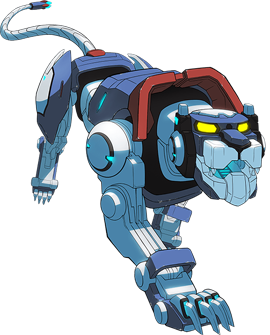 Similar to its pilot, Lance, the Blue Lion's confidence comes in handy in tough battles against bigger and better opponents and can easily take them out with its powerful freeze ray and sonic boom. 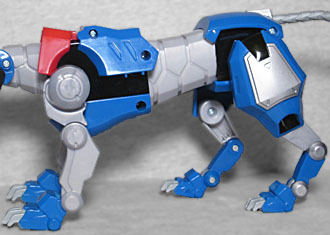 The Blue Lion has incredible powers to operate in water. It can withstand the pressure of the depths and navigate through ice. 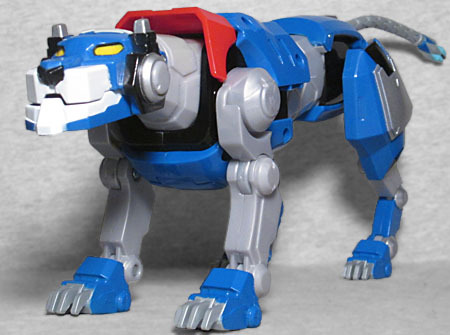 Voltron's design supervisor, Christine Bian, has said that the Blue Lion was the first one designed, with all the other Lions built off its base. That makes sense, since (as one of the leg-bots), it's right in the middle, size-wise: start with the Black Lion or either of the arms, and you have to make two size derivations to get to the other end of the spectrum; start with a leg, and you only have to go one in either direction. And a good design it is! 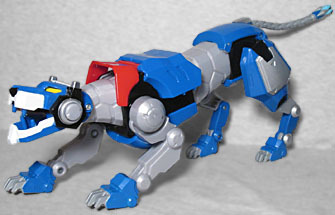 While the 1984 Blue Lion was basically a colored brick with silver limbs, the modern take is actually shaped somewhat like a real animal. In fact, it looks like a silver lion wearing blue armor: the neck, waist, and tail would all be the exposed "skin," while the chest and hips would be protected. The body armor is angular, while the bits on the hips are more rounded and smooth, but without the two sections looking like they belong to separate designs. The fact that the paws are blue and the claws are silver make it look like the lion is wearing little fingerless mittens, which is super cute (but also draws attention to the threat of the claws, which is smart color work). The head is very squarish, making it clear that this is a robot, not a metal animal. It has yellow eyes, a white muzzle and black nose. There are silver and black constructs forming the cheeks and ears, and a silver patch behind the red triangle inset in the forehead. The blue runs under the chin and along the jawline, culminating in a white bump on the front of the chin. The interior of the mouth has four teeth, plus a cannon port for the Lion's freeze ray, and a ladder so the pilot can get in and out. You won't really be able to display either of those, though, because the jaw is spring-loaded to close automatically. Other than that, the articulation is pretty good. The head can tilt side-to-side or up and down. There are swivels at hips and shoulders, then two more hinges in the front legs and three in the back. Plus the tail can spin around, but that's more a question of construction than intent. If the shoulder and hip joints had been swivel/hinges or balljoints, it would have given us a lot more options when posing, but the robot needs to be stable in leg-mode, so what're ya gonna do? 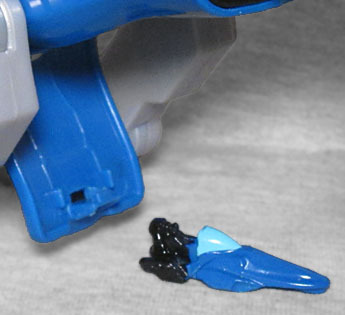 There's one more joint, for a play feature: the chest hinges open, revealing a slot for the Blue Lion's speeder. The speeders are the way the pilots get into the Lions, and can also be used for personal transportation on a planet's surface. 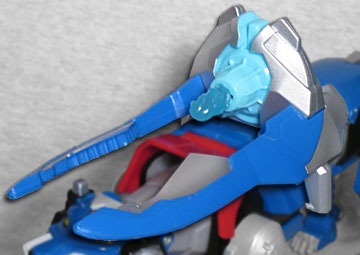 They each have a different design, and Blue's is long and pointy, with a light blue windshield and its pilot molded in the seat. The paint on the final piece isn't as detailed as the image on the back of the packaging would lead you to believe, but the fact that this piece even exists and it can plug into the Lion perfectly is pretty dang cool. That's not the ony accessory we get, either. Each of the pilots - known as the Paladins of Voltron - have a weapon called a "bayard," and when they plug it into the Lion's control console, it can manifest a special weapon. In the Blue Lion's case, that's a gigantic Sonic Cannon. It's silver and blue, with two long forks that point forward and a light blue energy blast in the middle. Press the button on the top, and it fires a translucent blue missile that's molded to look like swirling energy. The cannon is made from three pieces - the blue forks are removable for some reason, possibly because it was easier to do them that way than as a single piece - and clips onto the Blue Lion's back securely. 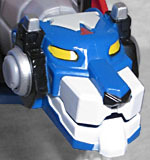 The Blue Lion was inexplicably found on Earth, and immediately chose Lance as its pilot. The reason was never revealed in-series, but the creators have said it's because the Blue Lion is a mothering figure who sees potential that can be nurtured and fostered. Lance didn't actually believe he was important to the team, so the Lion confirmed it by choosing him first. Don't we all just want someone to believe in us? This combinable Blue Lion is a good figure, though at 8" long (not counting the tail), it's a bit large for my tastes.